Are you dreaming of a Jiuzhaigou adventure? Colorful lakes and forests. Multi-level waterfalls and snowcapped peaks. Mysterious Tibetan villages and temples. Jiuzhaigou National Park offers countless opportunities for discovery and we hope you will have fun, make lifelong memories, and develop a deep connection to this miraculous wonderland. 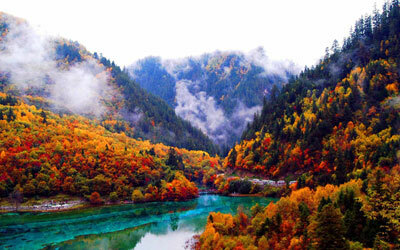 The best time to visit Jiuzhaigou is September and October because the leaves look colorful and the weather is mild (7 -18℃). April to August is also good for visit for fewer crowds. Jiuzhaigou has 108 lakes. Some lakes have a high concentration of calcium carbonate, and their water is very clear so that the bottom is often visible even at high depths. The lakes vary in color and aspect according to their depths, residues, and surroundings. In different seasons, you can see the curious color patterns of blue, light green, dark green, turquoise, emerald, light yellow, russet, and crimson. 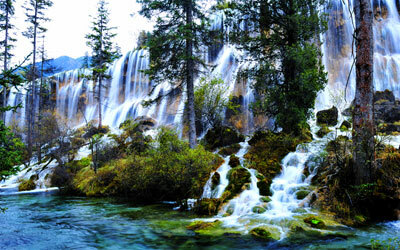 Jiuzhaigou is home to 17 multi-level waterfalls. All these beautiful natural wonders are always connected with the beautiful lakes. The forests of Jiuzhaigou contain at least 2,000 species of plants. In fall, the leaves turn into reds, yellows, oranges, browns and all the forests create a colorful fairyland! Snowcapped peaks and blue ice waterfalls are the winter highlights. Like all places, winter changes the landscape. And Jiuzhaigou Valley is breathtaking and uniquely different in winter! 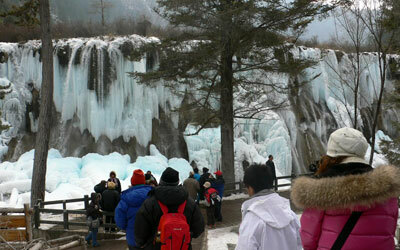 Jiuzhaigou offers many wonderful culture shows. The most famous one is Zang Mi Tibetan Music and Dance Show. 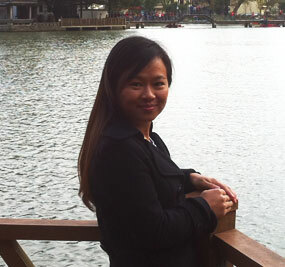 It tells a story about an elderly Ama pilgrimaging from Jiuzhaigou to Lhasa, and what she saw and heard. She sets off with only her pet sheep as companions and prostrates herself every 3 steps the whole way. Anyone who has seen anything of Tibetan pilgrims will have seen such devotion. The show begins at 19:30 pm every evening at Jiuzhaigou Zangmi Grand Theatre. Some hotels or Tibetan families offer wonderful bonfire parties, which give you a once-in-a-lifetime opportunity to enjoy with the locals: you can eat and drink with the locals, learn how to sing Tibetan songs with their special music instruments, and also learn the Tibetan dance - Guozhuang. Jiuzhaigou Valley is at the northeastern end of the Min Shan Mountains. It is 460 km to the east and 430 km to the west of Chengdu, the capital of Sichuan. The notable local food and drink include: milk products, highland barley wines, Yak meat, Zanba (a kind of glutinous potato cake), and so on. 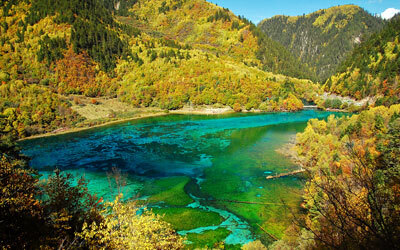 The best way to get to Jiuzhaigou is by air via Chengdu, Chongqing, Xian, Guangzhou, Beijing and Shanghai. There are no hotels or commercial accommodation inside the park. 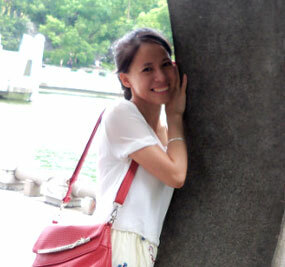 There are a number of 5 star, 4 star and 3 star hotels just near the main entrance to the park or Zhangzha Town.